While the continental U.S. has been shivering from coast-to-coast with temperatures dropping as low as minus-40°F amid one of the most severe early December cold snaps in several years, one state bucked the trend in an historic way. The same contorted jet stream pattern that brought the brutal cold to the lower 48 states pushed a pulse of milder-than-average air into Alaska, where some spots recorded temperatures unheard of for December. Map showing temperature anomalies in the atmosphere, including notes showing the unusually warm air over Alaska (red area) and cold air from Canada to the U.S. (dark blue area). Click image to enlarge. Credit: Modified from Tropicaltidbits.com via WeatherUnderground. Along Alaska's northern coastline, which lies above the Arctic Circle, the warmest December temperatures on record in at least 70 years occurred this past week. At the airport in Deadhorse, which serves the oil production hub of Prudhoe Bay, the temperature hit 39°F on December 7, the highest December temperature on record there since at least 1968, said Rick Thoman of the National Weather Service (NWS) in Fairbanks in an interview. Even more notable, perhaps, was the fact that it was raining, rather than snowing. Rain there is unusual so late in the year. Previously, the highest December temperature recorded at any of the two climate observation sites that have served Prudhoe Bay over the years was 35°F, set on Dec. 31, 1973, according to Chris Burt, a blogger at WeatherUnderground. Thoman said it’s possible, but not likely, that other climate stations in that area — such as data collected at now defunct Cold War-era early warning radar stations — recorded slightly milder December temperatures when they were operating in the 1950s and 1960s. December high temperature records were also set or tied at Barter Island AFB, which is a tiny airport located on a sliver of land along Alaska’s wind-whipped North Slope region, and in the small village of Wainwright, another Arctic shore location. Barter Island reached 37°F, which tied its record last set in 1973, and Wainright hit 32°F, beating the old record of 30°F last set in 2006. Some weather stations located along the Dalton Highway south of Prudhoe Bay saw temperatures climb into the 40s, Thoman said. Other noteworthy Alaska records included a December record high of 54°F in King Salmon, which is situated along Bristol Bay in southwest Alaska. That broke the previous record of 51°F, and records there date back to World War II. Daily high temperature records were also set at Kotzebue, Bettles, and Cold Bay, Alaska, among other locations, Thoman said. The first nine days of December ran 22.2°F above average in Barrow, and 18.5°F above average in Kotzebue, according to NWS data. A strong ridge of high pressure was the main cause of the record warmth in Alaska. The high shunted the jet stream, which is a high speed current of winds in the upper atmosphere, to the north of the state, while simultaneously displacing cold, Arctic air southward into Canada and the continental U.S. The small northern Alaska community of Wainwright, pictured during the summer. In recent years, studies have shown an association between extremely wavy or “amplified” jet stream patterns, with large ridges and troughs, and Arctic sea ice melt and snow cover decline during the spring and summer months. It's an active area of research, but there’s no doubt that climate change has been having profound impacts in Alaska and other areas of the Arctic region. The 2012 Arctic Report Card depicted a region undergoing rapid and pervasive changes related to manmade global warming, including the ramifications from plummeting spring and summer sea ice cover, melting permafrost, a rapid loss of spring snow cover, and various other climate change impacts. The 2013 edition of the Report Card, published by the National Oceanic and Atmospheric Administration, will be released on Thursday. Recent news reports from Alaska show that increasingly mild fall seasons and erratic weather patterns have had significant effects on local communities. For example, In Wainwright, changes in weather patterns have diminished the opportunities for subsistence hunters to safely hunt whales and caribou during the fall harvest season, according to a new study published in the journal Arctic. Alaskans have also seen a precipitous decline in the Western Arctic Caribou Herd, which is thought to be a result, at least in part, of an increase in fall freezing rain events. A colder atmosphere used to produce more snow events, but ice storms have become more common along the caribou’s migration routes, which is helping to thin the herd, according to reporting by the Alaska Dispatch. 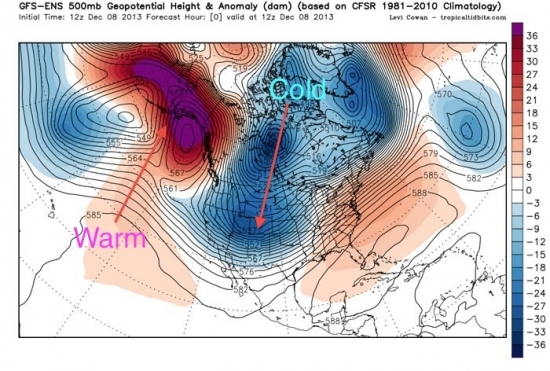 Although the long-term forecast calls for continued warming during the next several decades, in the near term, the high pressure area over Alaska is weakening, allowing colder air and snowier weather to return to the Frontier State, Thoman said. The upcoming weather pattern will be “A big change from what we’ve had, that’s for sure,” Thoman said.